Moosa visited Ihuvanfushi to get his ship fixed before heading home and that’s where he met and fell in love with Sanfa. 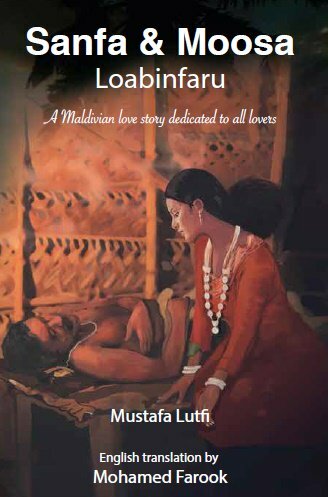 Sanfa also fell inlove with Moosa but she is betrothed to the Atoll Chief as per her father’s orders. Through the help of Sanfa’s sister, the two met one night and expressed their love for each other, then Moosa had to leave after two days. He promised to come back. Due to political unrest in Addu, Moosa was stuck for years as the government imposed travel ban. He even got himself in jail for trying to escape. Sanfa refused to marry the Atoll Chief several times but her father never gave up. On the night before her wedding, Sanfa disappeared only to be found lifeless on the shore of Fusfaru Island after several days. Moosa reached Ihuvanfushi after 9 days of sailing from Addu only to find out that the love of his life has been buried already. Moosa started seeing the ghost of Sanfa and started talking to it and people started worrying about his sanity. Finally when his parents came to Ihuvanfushi to fetch him and bring him back home, he died. He fell from the boat on the night they started sailing back to Addu and was found after few days on the shore of Fusfaru Island. The story is a typical Romeo & Juliet, fighting against all odds love story. A couple who was played upon by fate, unlucky by all means. A very painful story that one can see in an 80s drama movie. The novel showcased Maldivian culture (including ghosts, black & white magic), a bit of religion, history and politics. Quite interesting. I felt odd reading the booking as the setting is 1940s Maldives but the language used seemed so modern for me. Maybe because the book was translated in English. Maybe it is totally different in Dhivehi. The story is very common but I didn’t feel bored reading it even though I already knew what’s the conclusion of the story. After reading this novel I kept on thinking about how difficult life was in the Maldives before technology came. When one can only travel by sea for days and days on. When a husband has to travel to Ceylon (Sri Lanka) to trade for weeks or months and the wife just waits and waits ’till he comes back, that’s if he comes back. When one cannot call or send a message or post a selfie or check in any place just so the family knows where he is. Tough isn’t it? Atoll – An atoll is a ring-shaped coral reef, island, or series of islets. An atoll surrounds a body of water called a lagoon. Sometimes, atolls and lagoons protect a central island. Channels between islets connect a lagoon to the open ocean or sea. *Ihuvanfushi is not a real island.